I’ve been going to the Snoqualmie Falls since I was little, it being just over a 30 minute car ride from my house in Seattle, WA. The first time I was 3, I don’t remember it but there are photos of little naked me splashing around on the rocks below the falls. Throughout my childhood we came there as a family. Then, in my teen years I continued to find myself drawn to the falls, I would bring friends to share with them the awe-inspiring nature of the falls. Little did I know what significant this place held and how contested it is. 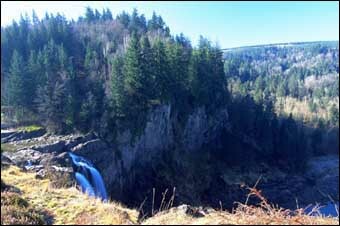 The Snoqualmie Falls are an extremely sacred space for the members of the Snoqualmie Indian tribe; it is the location of their creation story and numerous other legends. Until doing this research I knew of the Snoqualmie tribe and I knew the falls were called Snoqualmie, yet I didn’t make the connection that this could be a sacred space for them. Also, I didn’t even hear of a controversy. I find this appalling that a place so close to home and to my heart could have so many dimensions unknown to me. 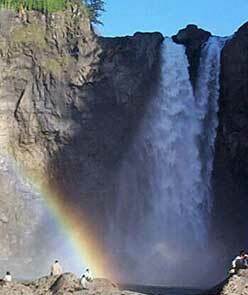 Snoqualmie Falls is a huge tourist attraction, with over a million visitors each year. Over the years the parks design has been developed exclusively with the ease and attraction of tourists in mind. Overlooking the falls there is a restaurant, a rest area and a huge, paved viewing section. At the top of the falls there is a mass of earth moving equipment and cranes. To the left there is the Salish Lodge Salon and spa. There are masses of camera totting tourists. The space has consistently gotten more and more developed the older I get. However there is a less developed area; a ten/fifteen minute walk down from the top of the falls through lust, green, mossy northwest old-growth forest brings you to the bass of the Falls. Due to the hike and the steep terrain the majority of the tourists don’t make it down. I love this spot and it has always held significance to me. Now, knowing what I know about its unique history it has made it even more special for me. The Snoqualmie people have inhabited the Issaquah area for 1000’s of years. The Falls hold significant for the Snoqualmie people in their very creation. In their legends the first man and women were created by the moon transformer, who is the son of an Indian women and a star. The Moon transformer also created a massive waterfall (Snoqualmie Falls). It is said that the mists from the cascading waters bring prayers up to the creator. The falls and the area around the falls has always been used as ceremonial grounds and their traditional burial site. It is where they believe they must burrow their dead in order to return their souls to the Creator. As Lois Sweet Dorman, a spokesperson for the Snoqualmie, said “The spirit is there to strengthen and heal us all. The cycle of water renews us, for it is the cycle of life.” Needless to say this is an extremely important spiritual location for the Snoqualmie. Today this space is endangered. The development of the Snoqualmie Falls area began in 1898 when the Puget Sound Power & Light Company built a hydroelectric generating plant at the falls. In order to make this plant the company blasted the face of the falls and excavated an underground cavern, the utility company channeled water through pipes to turbines at the base of the falls. In 1957 they built yet another power bellow the falls. Puget Sound Power & Light Company, renamed Puget Sound Energy, currently diverts 93% of the water flowing down the falls into its generators. This reduces the massive, awe-inspiring flow to a mere trickle of its former majesty. Also, the plants at Snoqualmie only generate 1% of the company’s total energy production. So, benefits to the company in having the plant at Snoqualmie seem greatly disproportionate the damages it causes to the falls. In 1989, Puget Sound Energy attempted to renew their license for another 40 years with the Federal Energy Regulatory Commission (FERC). Included in the proposal was an addition of generating turbines and an increase in diversion of water from the falls. This proposal further enraged the Snoqualmie people who were already fed up with the massive desecration of their sacred site coming from all directions. Like similar issues of contested sacred lands all over the world the Snoqualmie people felt their spiritual needs were being completely disregarded and they were trying desperately to have their voices heard. In response to the company’s proposal the Snoqualmie people rallied with the help of other religious organizations and sympathetic parties. They formed the Snoqualmie Falls Preservation Project (SFPP) and launched an activist/educational campaign to preserve Snoqualmie Falls in as natural a state as possible. In order to accomplish this they proposed the company be decommissioned and a sanctuary park be created. This proposal was shot down by the FERC. As yet another threat to the falls the 1990s the Falls Crossing Project, a massive residential development, was proposed for the surrounding areas of the falls. The SFPP educational campaign was successful in that eventually the Cascade Land Conservancy, King County and the City of Snoqualmie eventually joined in the Snoqualmie Preservation Initiative and in the negotiations to scale back the development project. By 2001 the Cascade Land Conservancy, funded by the city and county, purchased 145 acres of land near the Falls from Puget Western, Inc., the development company. It was the then agreed to preserve the land forever for the public to enjoy. In some ways this was a great victory for the tribe. However, they did not reserve the co-management statue they wanted of the falls. Also, unfortunately, the application for license renewal and increased water diversion proposed by Puget Sound Energy was approved by the FERC. The Snoqualmie people and sympathetic parties have taken this issue to court and have vowed to fight till the end. All and all there have been victories and defeats for the Snoqualmie people in the fight for their sacred land. Sterling, John. “Sacred Snoqualmie Falls faces hydro threat.” Earth Island Journal 9.2 (1994): 23. Academic Search Complete. EBSCO. Web. 28 Jan. 2011. Magnuson, Jon. “The mending of creation.” Christian Century 110.13 (1993): 420. Academic Search Complete. EBSCO. Web. 28 Jan. 2011. Powell, Joseph. “Snoqualmie Falls.” Quarterly Review of Literature. 31. 1997. Academic Search Complete. EBSCO. Web. 28 Jan. 2011.